Rehability´s occupational therapists will also advise on height adjustable care beds, including beds by BAKARE and LAYBROOK. Please contact us for further information. 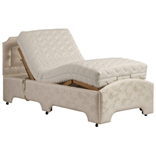 The Volker 3080 adjustable bed boasts exceptional features and beautiful aesthetics. The 2 part side rails reduce the feeling of restraint and provide assistance whilst transferring in or out of the bed, and when not in use they disappear below the lying surface. It has multi-positional lying surface with easy to use controls. Retractable wheels and electronic braking. It also has a tilt function. Choice of colour and mattress. 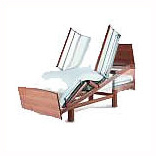 The Richmond Adjustable Bed by Rise and Recline Ltd. The Cromwell Adjustable Bed by Rise and Recline Ltd.
A traditionally styled single bed designed with practicality and affordability in mind. The Cromwell is supported by four polished wooden skittle legs and, with 8" clearance and is ideally suited for hoists and over-bed table access. 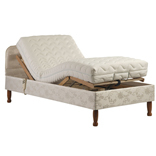 Birch hardwood support rails and corner gussets ensure a strong but simple design, complemented by high-quality upholstery and a choice of mattresses.